Information about schedules and tickets. 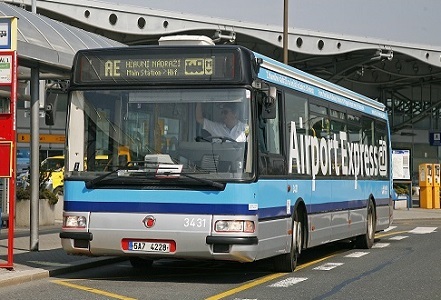 The Airport Express buses connect the main railway station (Praha Hlavni Nadrazi) with the airport in Prague. There are no other stops. runs daily from 5 a.m. till 9 p.m.
low-floor vehicles with an additional space for luggage. Tickets bought directly from the driver. Attention: usual Prague public transport tickets cannot be used in the AE bus line. The stop is placed on the Wilsonova street on the upper level of the station. You can access it by escalators from the departures hall or from the 1st platform. Follow signs (bus symbol) to find the stop. The stop (for disembarking and boarding) is placed in the public transport terminal in front of the terminal building of the Vaclav Havel International Airport Terminal 1. This terminal is for flights from/to countries outside of the Schengen zone. The stop (for disembarking only) is placed in the public transport terminal in front of the terminal building of the Vaclav Havel International Airport Terminal 2. This terminal is for flights from/to countries within the Schengen zone.